Wildcat_1, I'm sorry you're having that problem; but I can't reproduce it on my machine. I'm running Firefox 3.6 with the 1Password 3.0.9 extension installed and enabled, and I can't make Firefox crash. Could you please send us your Diagnostics Report, as Jamie describes above, and your 1Password log files? In Finder open Users > your-name > Library > Logs, Control-click on the 1Password folder, and choose Compress 1Password. This will create a new file called 1Password.zip. Attach it, along with the Diagnostics Report, to an e-mail reply to this message. Thanks for the reply, quick update. I blew away my FF profile tonight and created new but sure enough same problem. QUestion I have is if I zip up the 1PSWD directory as you mention am I at risk of sharing my password file ? Obviously I am loathed to let that out of my sites. Neither the Diagnostic Report nor the log files contain your 1Password data. Even if it did, someone would need your master password to decrypt it, and only you (should) know your master password. Thanks a lot for your patience, folks. I know this is a frustrating situation. This assumes you have Firefox in /Applications, so adjust your Firefox path if not. This will create a file named firefox-output.txt on your Desktop. This file should be pretty small, so open it and paste the contents here. (If it's very big, you can attach it as an attachment or email it to us with a link to this thread.) The file will show any Objective-C exceptions so we can see the stack trace and hopefully get to the bottom of this faster. It might not make it 100% obvious, but it will give us a jumping off point for further investigation. Please know that we're looking for anyone with this failure that has gotten any output from the dtrace command that Jamie posted to please let us see the output. This is a true puzzler and Firefox doesn't give as much information as it did in versions past about why it's not starting up. I am also having the same issue with 1Password and Firefox 3.6. Every time I try to install the extension, Firefox refuses to load. I must completely remove the Firefox profile and have it build a new one to get it to start again. I've got the Firefox crash problem, and so have used the dtrace command as you recommended. However, when I do this it seems that the 1Password Addon does not get loaded. If I launch Firefox normally it does load. I did not change any preferences in between launching Firefox your way, or "normally". In order to identify the cause, I disabled the FF extension in 1Password and fair enough, FF works fine. It also works in safe mode (hold down the alt key when launching), so pretty confident it's 1P. Rebuild, cache cleaning, etc all fail to fix the problem. I can't seem to reproduce the problem on FF under root (i.e. with the sudo dtrace command, as this doesn't run with usual rights) as the extension isn't loaded. Loading the extension and so forth as root did not reproduce the problem. I'd be willing to run the 1Password program in a debug mode and send the logs back, or run a debug-enabled 1Password copy and do the same. I also have a diagnostics log if this would be of help. Contact me through my account email if this is of interest. Loading the extension and so forth as root did not reproduce the problem. This is interesting! Thank you, Jason. I will mention this to the team and see if maybe it could be relevant. Interestingly I was having the same problems described above and was sure that Jamie's solution would solve the problem. I am running Firefox 3.6 on a 10.6.2 Macbook. But for some reason my Firefox instance will not launch if I have any extensions enabled. I only have two extensions and 1P is one of them. With both disable, Firefox launches fine. If I enable either one, Firefox will not launch. So now I am going to the Mozilla support site. Thank you for that additional information! That the problem may be related to extensions as a whole and not specifically 1Password is interesting. We continue to try to understand what is happening here. Here is some more data on this issue: I have 2 Macs, both running 10.6.2 and FF 3.6. I made sure both have the most recent 1P version. On my iMac, FF 3.6 and the 1P 3.09 extension work just fine; I encounter no problems. On my Macbook, I uninstalled all extensions and then installed the 1P 3.09 extension. FF will not launch. I have posted this on the Firefox forum but so far the replies suggest the problem is the extension which I do not believe to be the case given the other evidence (iMac). I don't know if some component of FF is corrupted in a way that only manifests with certain kinds of extensions? Until this is resolved I am pretty much using Safari. Part of the trouble has been that most, if not all, of us on the 1Password team have Firefox 3.6 and 1Password 3.0.9 installed, and none of us has been able to reproduce the crash. I only have the 1Password extension installed but I'm sure others on the team have other extensions, as well. So yes, it is most confounding that some systems are affected and some are not. It does appear that on the affected systems, this does not seem to be an extension-specific problem. Hi pwozny, welcome to the forums! Just to clarify, are you using the built-in session manager (in Firefox) or an addon? We are working on the issue, sorry it's taking a while to track down exactly what the problem is. Very cool, thanks for following up! First, I went to the Mozilla site but don't see a version 3.6.2; just 3.6 which is the one causing the problem for me. these files so the FF could recreate them but that did not fix the problem. I repaired permissions on my Macbook and that did not fix the problem. I then created a brand new profie. With no extensions and the new profile enabled, FF launched fine. I added the 1P extension (again, not believing that it is really the 1P extension that is the problem) and FF won't launch. Its a beta one of my computers downloaded by autoupdating digg arround after it, i might try to find it later on. This is all very hard to understand. I just found FF 3.6.2 is available for download. I downloaded and installed. But it still will not launch with the 1P extension enabled. I am going to try some other extension tomorrow to see if I can confirm my belief that it is specific to 1P but rather is either something corrupted in my OS or something corrupted in the FF configuration. I meant to say in my last post, "it is NOT specific to "
We're kicking around an idea that might be a red herring, but for those of you having this problem we'd like it if you could check on a system setting for us. I've attached a screenshot of what we're looking for from Apple's Disk Utility application. I've got two machines (MacBook Pro and an iMac), both with FF 3.6 and 1Pwd 3.0.10 Beta 1 installed. On the iMac, FF launches fine with the 1Pwd extension loaded, on the MBP, it crashes on startup. Both machines disk settings are set to Mac OS Extended (Journaled). If any one of these is enabled (either alone or together), FF crashes on startup. I checked both my Macs, the iMac that works fine with FF 3.6 and 1P 3.09 and the Macbook which does not launch with FF3.6 or FF3.6.2 and 1P 3.09. 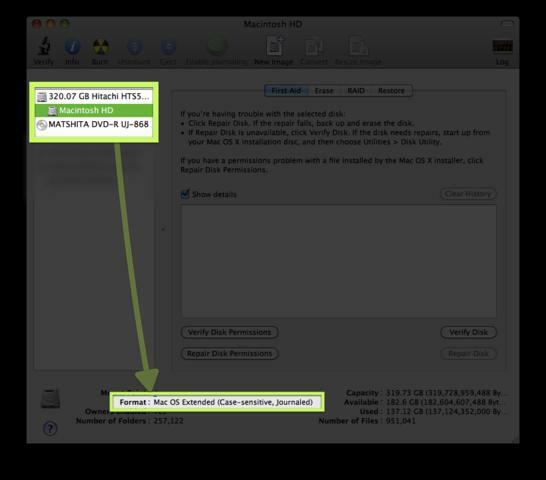 Both Mac systems show the disk format as Mac OS Extended (Journaled). I have another red herring thought: It seems that at least two of us have the following: Everything works fine on our iMac but not on our Macbook. Does anyone else observer that behavior or is it just coincidence?